The Carpenter's Ministry Toolbox: ADVENT: A GREAT Advent Devotion Book! A fantastic story to read to your children over and over again every Advent season! I was recently introduced to a well written story regarding the coming of the Christ child called Behold the Lamb of God. It is written to be read in the 25 days leading up to Christmas. Of course, the Bible is not a novel and gives little detail so the author fills in with historically accurate descriptions. Download a sample from The Rabbit Room here. It will hold a child's interest and would be a great Advent devotion to read aloud with the whole family though some things may need to be explained to the younger ones. 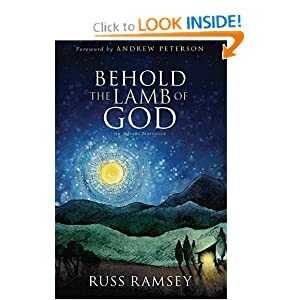 One of the things that struck me was in the preface when the author, Russ Ramsey, says, "I found myself in the Middle East not too far from Abraham's desert, lying on my back, staring up at that same starry sky. In the desert, the night is a magnificent thing to behold. The Lord silenced me with His glory." Now, think about how stunningly glorious that sky must have been on the night Christ was born. Oh, to witness that!! It is available in hardcover and on CD at The Rabbit Room and in hardcover at Amazon.com here. I LOVE it when I find a great resource like this! !